>>> now to the crisis in africa, where millions of fighting for their lives in the face of famine, violence and drought. ann curry has an extraordinary look tonight at the capital of somalia tonight, mogadishu , the danger, the high stakes and how it got this way. >> reporter: mogadishu , somalia , it's the capital of chaos, torn to ruins by decades of war and anarchy. it is filled with weapons and suffocated by fear. this is where black hawk down happened. where somali pirates operate. it's considered by many the most dangerous place in the world, even by the battle-hardened. >> i think no one nation anywhere, no one place in the world anywhere, like somalia . >> reporter: lieutenant colonel paddy okunda takes us through the front line of just the latest fighting. our armored personnel carrier at the ready for any sign of attack. we keep moving. ieds and suicide bombs an ever-present threat. at one stop, seconds after an ak-47 sounds off we move quickly out of the area. peacekeepers at the moment are wing the battle for territory against al qaeda -support islamists called al shaba. you are saying this is the training ground for al qaeda ? the spread of islamic terrorism has turned a drought into a famine that didn't have to happen. the violence making it hard for international aid agencies to reach people in need . all these children are hungry. they have their hand also out, they are shaking my hand, and yet they are still smiling. and with the need so great, especially with the lives of millions of children in the balance, one frustrated aid worker asked me, where is the humanity? ann curry , nbc news, mogadishu . 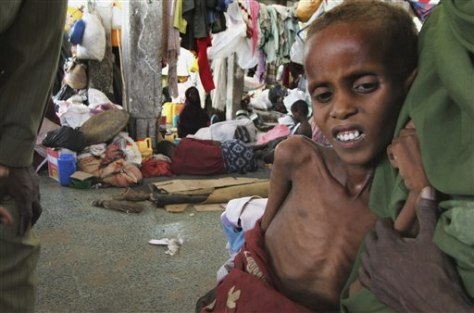 A woman from southern Somalia holds her malnourished child in a refugee camp Monday in Mogadishu, Somalia.